The birth of any animal is amazing. The birth and pregnancy of a llama was the part of owning llamas that I enjoyed the most. I started off just breeding and then began to breed for personality and eventually for personality and excellent wool. I achieved this as some llamas were born with wool equal to, and sometimes better than, an alpaca, which are bred for their wool. I then went on to breeding SURI llamas which once again had an even nicer grade of wool -soft, warm and non irritating. 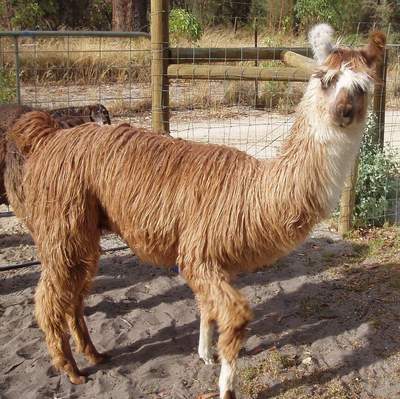 Majestic was bought from Melbourne as, at the time, there was no gene pool of suri llamas (they have long curls of hair), and he grew up to be a very handsome, stately and gentle boy, who bred more Suri llamas. This is pure chance as you do not know what colour or type a llama is going to "throw" each time. After several generations of suri llamas, your chances of births being suri, is greater. The photographs in this article are very graphic so be warned! Llamas generally only give birth in the morning which is quite handy for us humans. They are restless and sit a lot and I could always tell when the birth was imminent. This is an exciting part! Occasionally I would help to try and release the baby's shoulder, though the books say to leave them. Before this happened I rubbed them down with a towel and peeled of remains of the sac if necessary. I handled the llama from birth so that they became friendly towards humans. I then left cria and mother alone in a padock for about 2 hours, to bond. Who would have thought this one would turn out beautiful! The mother is preparing to get rid of the afterbirth from minutes up to an hour later. When first born they cannot regulate their temperature so if in winter, I would always put a coat on them before sunset, and keep them locked in the barn with their mother. The other llamas cannot wait to come and greet and kiss the newborn. In turn they all rush round him/her. This baby, name Gretl went on to be one of the quirkiest llamas I bred. She used to like to drink from the tap and it was so funny to watch her, and she had a very playful, loving nature. It was a very sad day for me when I had to sell Gretl, however she and another llama baby went to a very good home.